A purported schematic for the so-called "iPhone 6s" obtained by Engadget Japan (via BGR) reveals that the next-generation smartphone could have a thickness of 7.1mm, a slight increase or equal to the iPhone 6 and iPhone 6 Plus, which measure 6.9mm and 7.1mm respectively. The schematic also suggests that the "iPhone 6s" will still have a home button, while all other buttons and ports remain unchanged. The slight 0.2mm increase in thickness could be the result of Apple adding pressure-sensing Force Touch technology to the next iPhone, enabling the smartphone's display to distinguish between a light tap and firmer press and complete different actions accordingly. The "iPhone 6s" is also rumored to adopt 7000 Series aluminum, which could possibly contribute to marginally different dimensions. 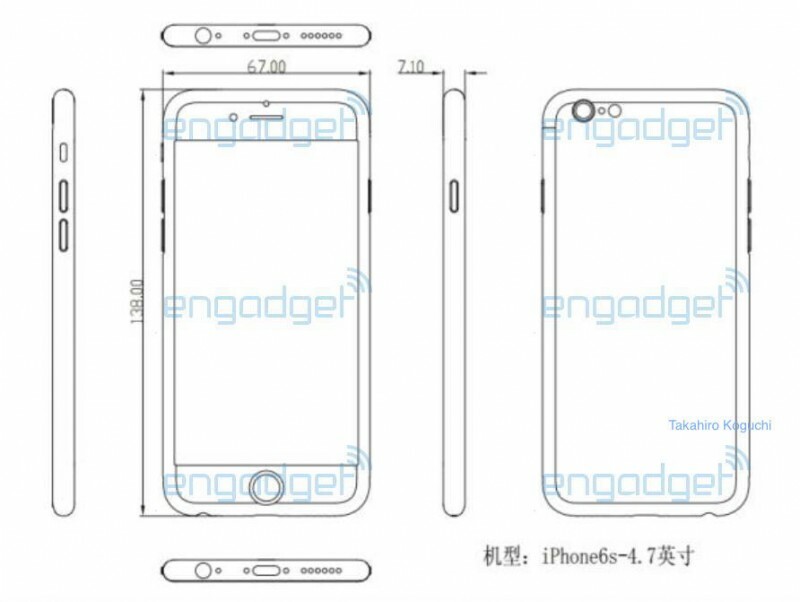 The schematic is consistent with leaked photos of the "iPhone 6s" rear shell, which confirm that the handset will have only minor design changes. In particular, the Lightning connector, speakers, microphones, headphone jack, volume rocker, mute button, sleep/wake button, SIM card slot, antenna lines and cutout for the rear-facing camera and LED flash are all identical to the iPhone 6. The lack of exterior design changes on the "iPhone 6s" is unsurprising given that "S" model iPhones have historically looked almost identical to the iPhone released one year prior. The iPhone 3GS, iPhone 4S and iPhone 5S, for example, each had virtually the same design as the iPhone 3G, iPhone 4 and iPhone 5 respectively. Instead, the focus of the "iPhone 6s" will likely be on internal improvements. Leaked photos of the "iPhone 6s" logic board reveal that the smartphone will likely feature Qualcomm’s MDM9635M chip, capable of theoretical LTE download speeds up to 300 Mbps, double the max speed of 150 Mbps in the iPhone 6 and iPhone 6 Plus. The next iPhone is also rumored to feature an A9 processor with 2GB of RAM, an updated NFC chip for Apple Pay and an improved 12-megapixel rear-facing camera. I'd welcome a thicker phone for an enclosed camera lens and bigger battery. Did anyone expect the home button to be removed? Why is that even part of the headline? Ditto... I'm not a fan of the Camera Ring. He's not. He CDO now. Sure that’s not Officer in Chief of Design? Jony Ive must be gone. The schematic also suggests that the "iPhone 6s" will still have a home button, while all other buttons and ports remain unchanged. So EVERYTHING remains unchanged then. What a sentence, MacRumors. Anyway, this reminds of when the iPad went thicker to accommodate the new backlights. I wonder if it will be any heavier as well. So he wasn't around when the iPad 3 got thicker and heavier? The camera bothers you that much? I have my 6 in one of Apple's silicon cases and the protruding camera is hardly even noticeable. Btw, according to Business Insider Jony Ive hates the protruding camera so I'm sure of there's a way to get rid of it without degrading the camera they'll do it. Yup, bothers me enough not to buy it. That and the antenna breaks. For a company that are all about aesthetics, (apparently), the 6 is a travesty. There is an easy way to get rid of it. A thicker phone. I’d prefer that. make the new phones as thick as the iPhone 4/4S and the battery will be incredible.. you can also probably squeeze in a crazy sensor into that camera.